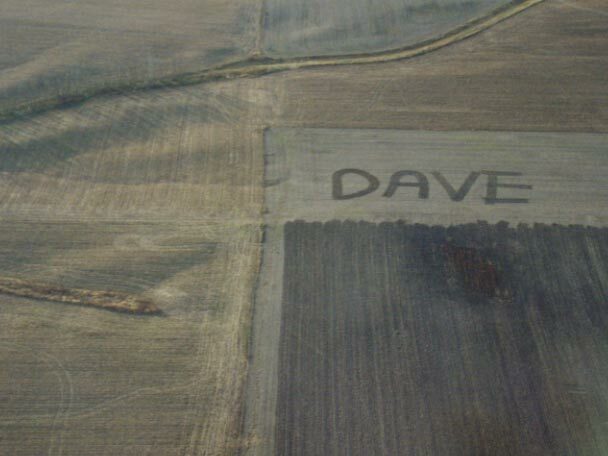 Possibly the world’s largest tagging – Dave has written his name across a field in Bunker Hill, IL. I guess he must have been really bored one day. 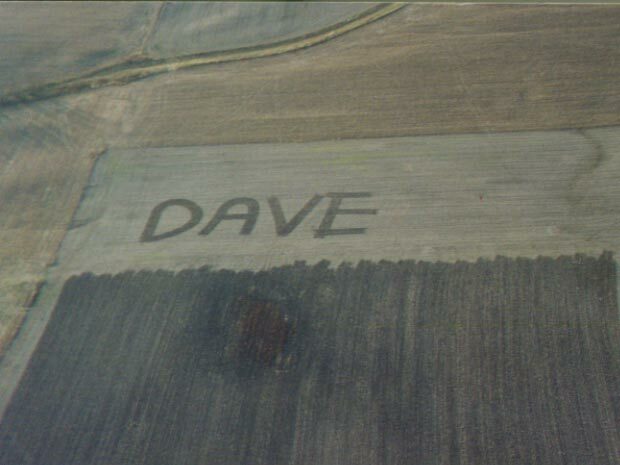 I’m the Dave, but to correct the caption, it was my neighbor Don (a farmer) who wrote my name with his plow because I fly a gyrocopter in the area. My airstrip can be seen by scrolling about 1/2 mile northeast of the name. Don’s farm and grass airstrip is about 1/2 mile south of the writing. Dave was also kind enough to email me a couple of shots (Picture 1, Picture 2) taken from his Gryocopter. Here are the snapshots I took during the few days the writing was in the field. Oddly the pictures from 100 – 200 feet in an open frame aircraft look very similar to the imagery from space when zoomed in. There are these giant “Â©2005 Google” letters everywhere, but they look like clouds. Do clouds count? Wow. Now that is amazing. Did Dave find this page on the Internet and contact you? The odds of someone finding this out of the billions of websites that exist. Amazing. And while im here, might as well add that I am a recent subscriber to your RSS feeds and must say, this site is awesome. I just love seeing all these places around the world that I never would have found. Keep up the great work. Look forward to seeing sightings for a long time to come. Here’s the same Dave only on a virtual other place. Hey Don and Dave, What’s that whale doing over there by you guys? yeah what is that huge whale like shape?